The Nobby Owners Association was formed in 1987. It was the Coburg Boat Owners Sailing & Angling Club who resurrected the idea of the Mersey Nobby Race by recreating races held by fishermen during the early 1900’s. They presented the Prawn Trophy for their first race in 1981 when six Nobbies entered. Local interest blossomed in the mid 80’s when national TV made a programme about the refurbishing of boats and the 1986 race of 15 Nobbies. Thus in early 1987, owners of Nobbies and enthusiasts agreed to a constitution and the NOA was formed. Brief history of the Nobby In the 1840’s, local builders began building copies of Cornish luggers, which came and fished the rich grounds around the Isle of Man and Morecambe Bay. Usually built without plans on the open beaches, these Morecambe Bay Prawners (to give them their correct generic title) could be completed by four men in six weeks using simple hand tools. 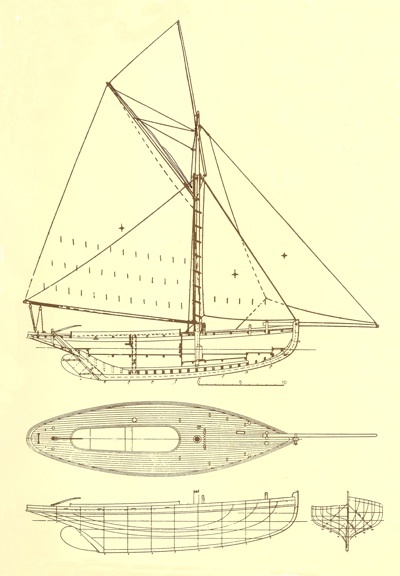 Although there were many variations in detail, the Nobbies were yacht-like cutters mainly between 30 and 40 feet in overall length. Developed for local requirements, they where fast and because of their low freeboard, very wet boats in a strong sea. The crew, usually two, worked from a deep narrow cockpit abaft the mast with high combings. The effective gaff rig provided power to tow a beam trawl and gave good down-wind sailing ability and speed to land the catch. The rapid expansion of seaside holiday business, thanks to the railway developments, helped bring about the wide use of the Nobby concept. The Victorian passion for shrimp teas and the growing need for pleasure boats and yachts helped more sophisticated design incorporating the best features, not only for fishermen but also pleasure sailors. Many boats built on Nobby lines were built as yachts for discerning clients.